Victoria Park RSL President Kelvin Liddiard was recognised in the 2017 Queen’s Birthday honour list with a Medal of the Order of Australia General Division for services to veterans and their families. He was proud and surprised to receive the honour. EVERYTHING that Kelvin Liddiard has done for the Victoria Park RSL sub-branch he has done for others and not himself. Among the projects he is proud of since becoming president of the organisation in 2009, is getting the original name of the sub-branch back and creating a memorial wall. His selfless acts were recognised with an Order of Australia Medal (OAM) in the Queen’s Birthday honour list. “Re-establishing the name of the sub-branch is among my proudest achievements, the Vic Park RSL formed in 1918 and had various names over the time,” he said. 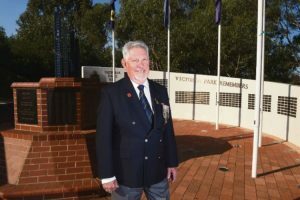 “After a factional split in 1999, some of the members went to the Cannington sub-branch and the one here was named the Vietnam Vets and East Victoria Park sub-branch. Mr Liddiard is also proud that he was a committee member for the creation of the Centenary Memorial Wall Project, which involved researching who was eligible for a plaque. “We had 431 names of people who were born in or lived in Victoria Park when they served in World War I,” he said. “We are now two-thirds of the way through screening people who served during World War II. Mr Liddiard said he was proud to be awarded the OAM, which came as a surprise. “Everything that we have tried to achieve is on behalf of the membership of the RSL, they are the most important ingredient,” he said.